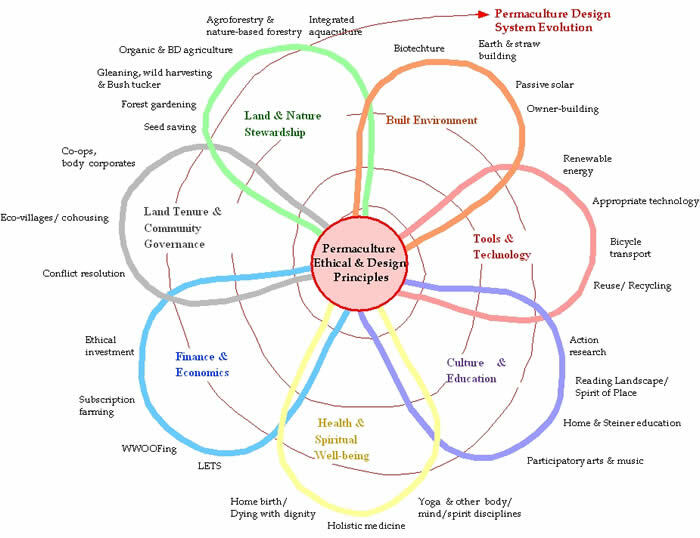 I have modified David Holmgren's Seven Domains of Permaculture (Land & Nature Stewardship, Built Environment, Tools & Technology,Culture & Education, Health & Spiritual Well-being, Finance & Economics and Land Tenure & Community Governance) to become the Seven Domains of my PDC curriculum. These are, Stewardship, Structures, Technology, Learning, Health, Economics and Community. Each of the Seven Domains has a core Project Based Learning Design Challenge, with the resulting design as that Domain's “authentic assessment”. The individual students will work with a combination of formal presentations by the teacher, resource readings, and discussion in order to acquire the foundational understandings and knowledge necessary for completing the Seven Design Challenges. The student will compile a portfolio with all of the outputs from the projects and designs that will become part of her Permaculture Design Certificate. Plan and implement an ecological design for providing the food, fodder, fiber, forage, fertilizer and “farmaceuticals” for a sub-tropical, self-sustaining community. 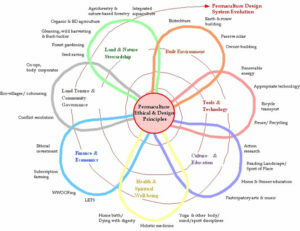 Integrate a small-scale animal system into a permaculture design. ecological design strategies for different scales of human settlement (residential, rural, broad-acre). The effects of climate on ecological design. The role of large herbivores in natural grassland habitats of the majority of earth landmasses. How can we design healthy systems? What does it mean to be a steward of the land? What is our relationship to native ecosystems and zone 5 , native habitat, forests, wildcrafting, and seed-saving? How can we modify water availability to meet our needs? How can integrating animal niches improve yields? How can we integrate large scale food production? How can humans live sustainably in different climates throughout the globe? How can we mimic Nature to design ways to build soil fertility? How can we design perennials to providing functions for us using guilds, food forests, windbreaks, hedges, alley cropping, and agro-forestry? How will you design human landscapes by using patterns, edges, observation, sectors, zones, client interview? designing a diversity of plants into a sub-tropical permaculture farm. Calculating the water needs and resources for storage and delivery on a farm. Design should include a base map, recommended plant species, earthworks, roads, paths, waterways, zones, and sectors. Design should be easily readable, well organized, with appropriately labeled keys, and have a professional look suitable for demonstrating competency to a potential client viewing the designer's portfolio. Create a permaculture design for the southern two-acre apprentice domain on One Song Eco-Spirit Village. Utilizing permaculture library resource materials for plant selections, and earthworks. Design a natural building for the sub-tropics. Design considerations for natural building structures in different climates. How can we shelter ourselves sustainably? What are different options for building from natural materials and their appropriate climates. Material selection and applications for sub-tropical natural buildings. Drafting/sketching standard architectural views and close-up detail construction diagrams. Drawings should be clear, accurate, and professional looking. Design a six-apprentice living structure for this climate from natural building materials which are now growing or are planned to be growing on One Song. Discussion with teacher about natural building examples and their pro's and con's in different climates. Reading resource materials on tropical buildings. Research on growing, harvesting and utilizing tropical building materials. Design a variety of heating and drying appropriate technologies using energy on-site available energy sources. Evaluate what appropriate technologies you have incorporated in your life. Describe appropriate technologies that were used by ancient Hawaiians. Principles of harnessing energy from renewable sources. The acceleration of human cultural modernization caused by technologies. What makes a technology appropriate. What is a sustainable technology? How did indigenous people use appropriate technologies in their lives? How to design a variety of appropriate technologies that might be useful for harnessing renewable energy for off-grid situations. The process of researching, designing, and building appropriate technologies. Assessment of the functionality of the design submissions. Demonstration of the functionality of the built technology. Design a system for cooking and baking, a system for heating shower water, and a system for drying fruit that don't require outside fuel inputs. Choose one of the above and build and test it. Internet research plans for the assigned designs. Discussion on the chosen systems. Implementation of the performance tasks. Evaluate a social system and suggest how it might become more effective as a learning system. The roles of positive and negative feedback in a learning system. The role of the “Three R's” - relationships, rigor and relevance in teaching and learning. What is a learning system? How does culture function as a learning system? What pedagogical strategies might be best used to create a healthy learning school. Clarity in explaining how elements function. assessment: Describe and explain how the pedagogical elements function in your personal learning plan for the PDC , including competencies, essential questions, project-based learning, authentic assessment, and portfolio. Design a personal program for health and well-being. The role of conflict and health in any system. What is a healthy system? What does it mean for a human to be healthy physically, mentally, emotionally and spiritually? What is the role of conflict and health? What does it mean to truly be eating locally? Basic principles of nutrition and diet. How to live entirely off food grown in the tropics. Planning a program of self-health including a nutritious diet. Design your ideal personal health plan for yourself as a member of the One Song Eco-Spirit Village. Include a sample menu for a week (using only food which is currently planted on the land); and a sample week of activities which you would integrate into your health plan. Design a Local Exchange Trading System (LETS). Design a business plan for a cooperative. What money is, and how it's different functions might best be served. What the true meaning of an economy is supposed to be. The underlying problem with our current global economy, and how an alternative local living economy might function. How a mutual credit trading system works. How and why a business cooperative works. What is an alternative economic strategy for facilitating local trade? What is a cooperative business? What are the effects of interest? How to design a business cooperative. How to design a Local Exchange Trading System LETS). Design a two-year business plan for six apprentices at One Song. Reading resource materials provided as needed. Help to organize any group to become a functional learning community. What the basis is for each of the best practices of sustainable eco-villages. What are best practices of sustainable eco-villages? How can we create more sustainable social systems (cities & villages, alternative legal structures)? How can power be managed to become an “infinite game”, and what are the different channels of power? The phases of a basic conflict resolution protocol. assessment: Design a plan for building community over a one-year period of time in the development of a six-person apprentice community.